Players like Stu Hamm like nothing more than a big bottom. And that's where the new line of Hartke bass speaker cabinets comes in. 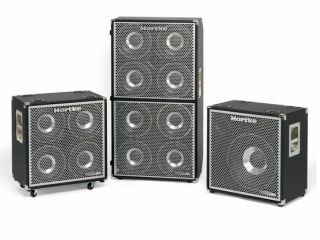 Moving beyond the parameters of traditional bass speaker technology, Hartke has introduced a new line of bass gear called HyDrive. HyDrive is a speaker design that fuses the warmth of traditional paper, while incorporating the punch and attack of aluminum, providing the best of both worlds for today's bass players. The patented Hybrid Cone Technology uses an outer paper cone for low, deep frequencies and an inner aluminum cone that produces punchy, articulate mids and highs. Using neodymium magnets and a cast aluminum frame, each HyDrive speaker weighs 40% less than a traditional bass speaker, yet handles 250 watts of power for the best power to weight ratio of any speaker available. "These days, musicians want versatility," says Stu Hamm, Hartke endorsee. "Contemporary bassists are looking for products that won't limit their style of music. We want power, we want tone, we want punch and we want control over all of it. The HyDrive speakers offer great sound and the amps provide complete control over your tone. From heavy-metal to jazz or anything in between, HyDrive has you covered." The Hartke HX115 offers one 15-inch, 500-watt HyDrive hybrid cone speaker. The HX410 has four 10-inch, 250-watt HyDrive hybrid cone speakers with power handling of 1,000 watts. And if your rocking a stadium, the HX810 cabinet has eight 10-inch, 250-watt HyDrive hybrid cone speakers for 2,000 watts of power handling. Each cabinet has a 1-inch Titanium compression driver for extended range and is equipped with a high-frequency attenuation switch as well as 1/4-inch and Speakon™ output connectors. The HyDrive cabinets feature stainless steel grills and inset side handles. The HX810 also comes with built-in steel casters and a diamond kickplate, while the HX410 and HX115 each come with four removable steel casters for easier transport.